Sweet potatoes are truly one of my favorite foods and I generally prefer them prepared in a savory way. The typical sweet potato casserole,the one laden with brown sugar and topped with marshmallows that’s so popular for Thanksgiving, doesn’t really appeal to me. But I love for sweet potatoes to be a part of our Thanksgiving meal. So instead I thought I’d try a savory sweet potato casserole. First I baked 4 large sweet potatoes in the oven until very soft, let them cool slightly, peeled off the skin, and mashed the pulp with a fork. I measured out 4 packed cups into my mixing bowl along with 2 tablespoons butter, 1/3 cup heavy cream, an egg, about 1/4 teaspoon cayenne pepper, and some salt and black pepper. I beat everything just long enough to get it all smooth. While the sweet potatoes were baking, I cooked some bacon, crumbled it, and set it aside. I used the bacon grease to cook a chopped onion. Is there anything better than the smell of onion cooking in bacon grease? Just before removing the onion from the heat, I added some fresh thyme and rosemary and immediately my kitchen smelled heavenly. I stirred the onion into the sweet potato mixture along with half the bacon and 1/2 cup shredded gruyere cheese. Into a casserole dish it went. I then added a little more shredded Gruyere on top along with some Panko crumbs and chopped pecans mixed with melted butter. 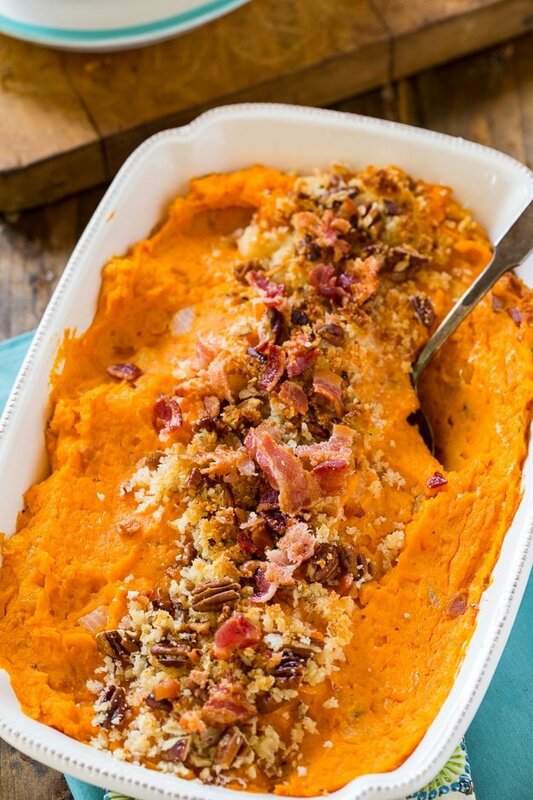 Wonderfully smooth, creamy, savory and just a little spicy, serve Savory Sweet Potato Casserole for Thanksgiving and save your sweet tooth for dessert! 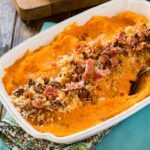 Savory Sweet Potato Casserole is full of onion, rosemary, and thyme and topped with crispy bacon and crunchy pecans. Bake sweet potatoes until very soft. Let cool slightly and remove and discard skin. Mash pulp with a fork and measure out 5 cups. Place in a mixing bowl. While sweet potatoes are baking, cook bacon in a nonstick skillet. Remove bacon, crumble, and set aside. Pour off all but 1 1/2 tablespoons bacon grease. Cook onion in bacon grease until soft, about 10 minutes. Just before removing from heat, add rosemary and thyme. To mixing bowl with sweet potatoes add 2 tablespoons butter, cream, egg, salt, pepper, and cayenne. Beat until smooth. Stir in onion mixture, 3/4 cup shredded Gruyere cheese, and half the crumbled bacon. Transfer mixture to a lightly greased casserole dish. Toss together melted butter, Panko crumbs and pecans. Top casserole with remaining gruyere and Panko crumb mixture. Bake at 350 degrees for 30 minutes. Broil just long enough to brown the Panko crumbs. Before serving top with remaining bacon. This entry was posted in Casseroles, Side Dishes. Bookmark the permalink. I made it for Thanksgiving. It was very tasty and had people ask for recipe. I”m going to make with Christmas dinner. Wondering if I can make it the day before and then do the finish work with the panko etc. on Christmas Day? Yes! You can get it all assembled and ready to go and refrigerate it. Add the panko just before baking. Do you think I could make this in the crock pot? We do a large thanksgiving that we bring our cooked dish to. I’m thinking the potatos will work, but the bread crumbs won’t brown. Any thoughts? I think you could cook it in the crockpot. Sometimes when I want crispy breadcrumbs on a crock pot dish, I brown them in a skillet with butter and then sprinkle them on top of the casserole just before serving. The recipe contains 2 different measurements for the sweet potatoes. In the description, it says that you used 4 cups. But, in the instruction section, it says 5 cups. Which is the correct amount? The description says 4 large potatoes and the instruction say 5 cups. 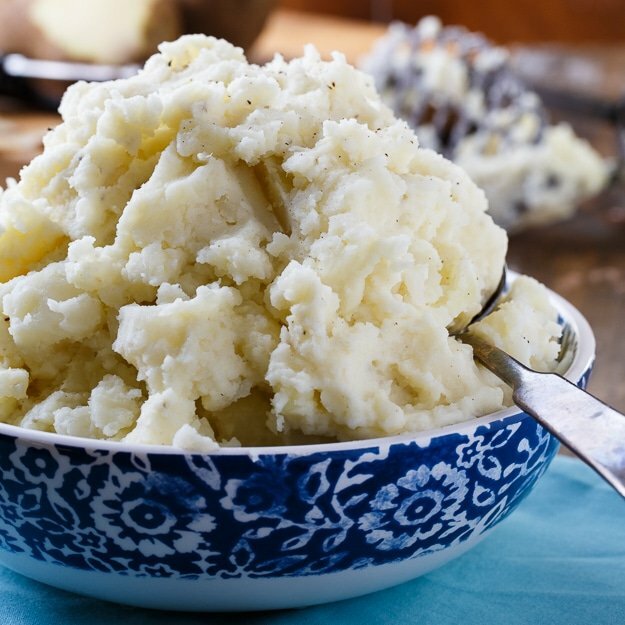 You want to use 5 cups of mashed sweet potato. $ large sweet potatoes should be plenty to get 5 cups of mashed. If you have extra you can freeze for another use (soup, pasta sauce, etc). I still haven’t found a way that my husband will like sweet potatoes! Christin , I know the feeling!!! I have not tied these…maybe they will work…sure sounds great to me! 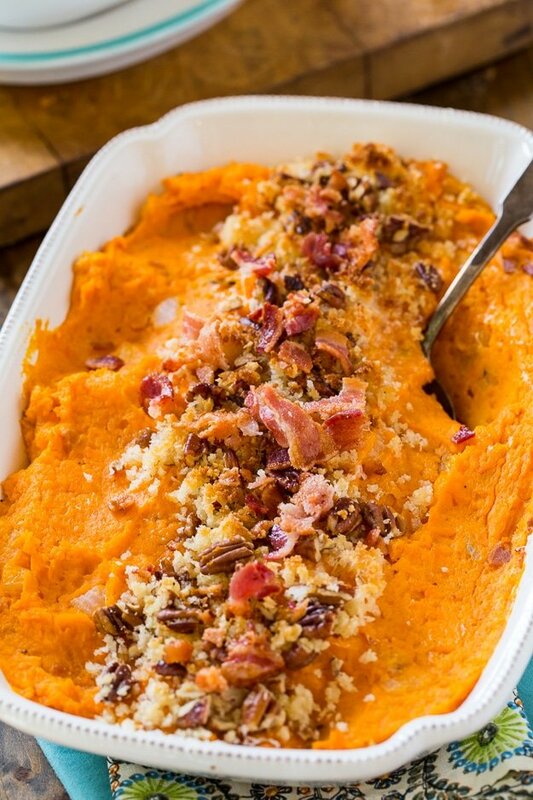 It’s nice to see a sweet potato Thanksgiving side dish that is not sweet. This savory version is a must try. I love all the cheesiness and of course the bacon! I love sweet potatoes and prefer them in savory dishes too so this casserole is just perfect! Love the bacon and panko crumbs! I love savory sweet potato dishes! Can’t wait to try this! I’m going to admit, I’ve never really understood the whole marshmallow and sweet potato thing — this looks right up my alley! Love the bacon! Christin this looks phenomenal!! 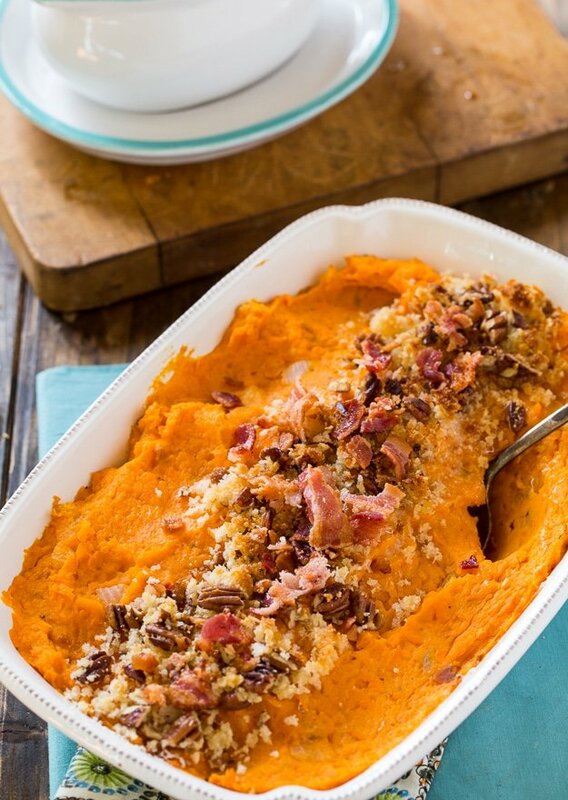 I am usually on the sweeter side of the when it’s sweet potatoes but this looks worth trying!! And I bet crumbled bacon must have been so good here!! I completely agree with you! Savory sweet potatoes are the best. Who can say no to bacon?! 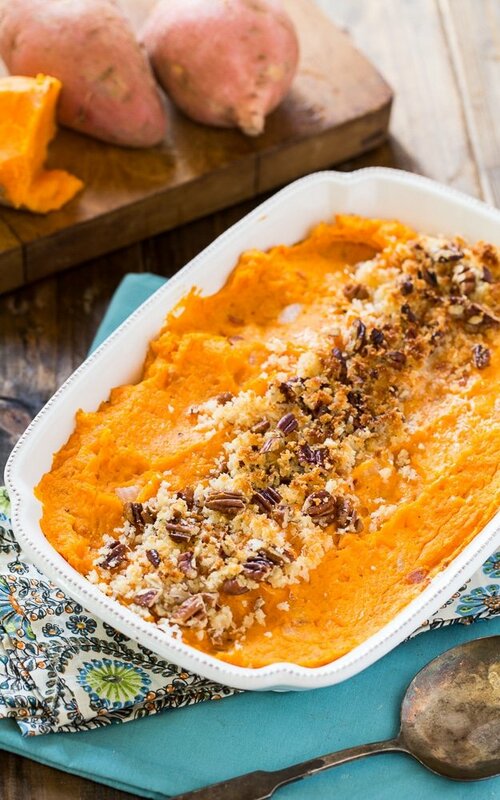 Sweet potato casserole is definitely a staple for Thanksgiving in my family! I love this savory twist, Christin! And that topping sounds so good! Sweet potatoes are one of my favorites but I don’t really dig the sweet preparations – savory all the way! Love this savory twist on a casserole! I love sweet potatoes, the only trouble is my children don’t. 🙁 It won’t stop me though, I will make this even if it is only for me and my husband, it looks amazing and I can just imagine the taste.